I am back at work today in Kameoka but one final blog post regarding my last two days in Himi. 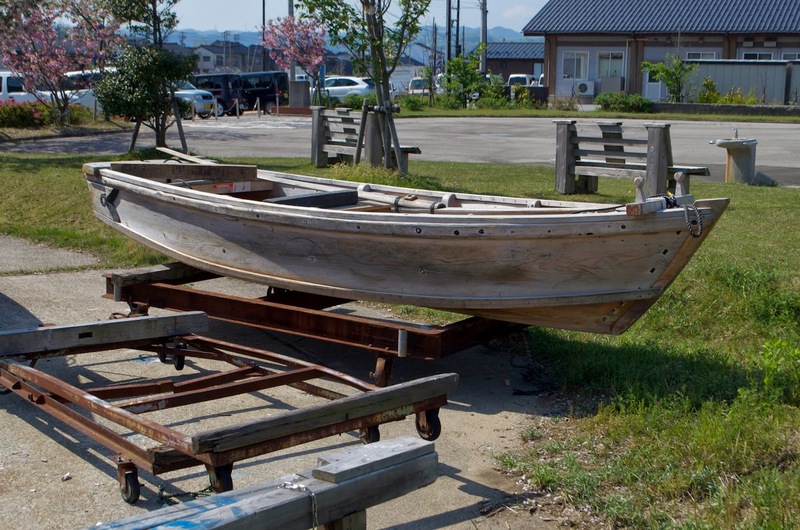 I stopped by the boatshop yesterday to say goodbye to Bansho san and one of the tenmasen was out of the water and on a carriage. This gave me a chance to get some clear photos of her bottom near the bow for readers. 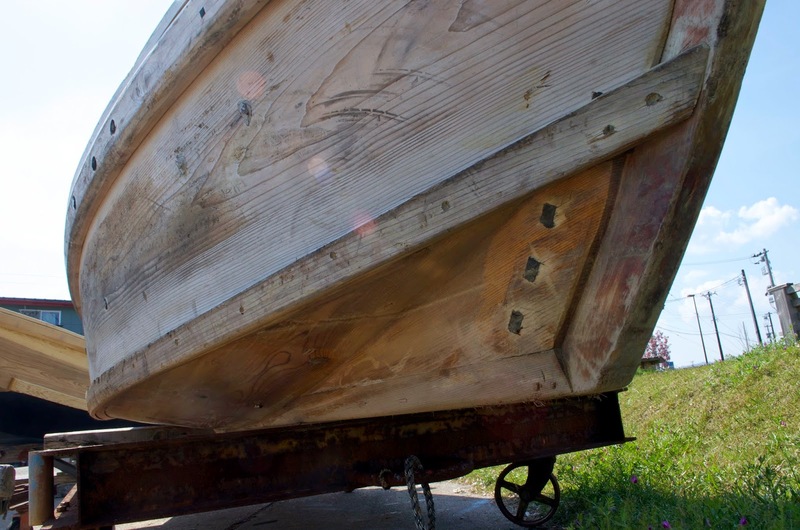 Note the vertical, triangular piece of wood that connects to the keel and stem, and how the bottom plank sweeps up alongside it. 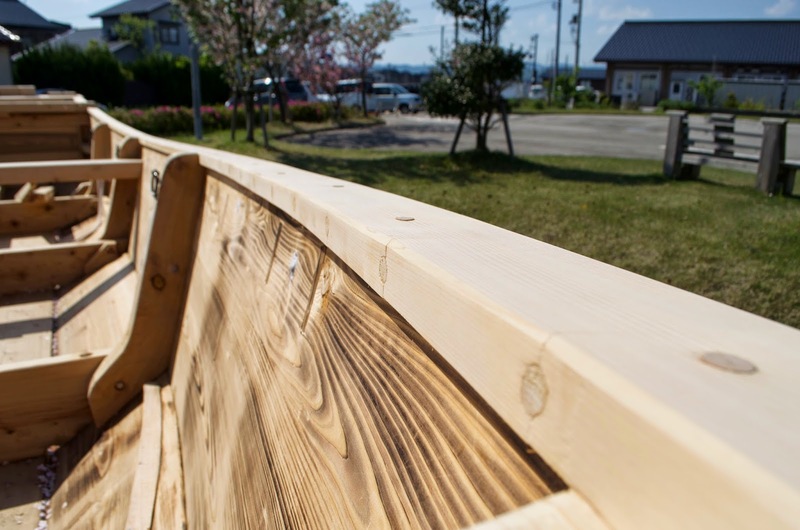 This construction can be found throughout Japan and according to Bansho san its to allow the construction of wider boats. What I see immediately is how it relieves the boatbuilder from having to twist the garboard from almost horizontal amidships to vertical at the bow. 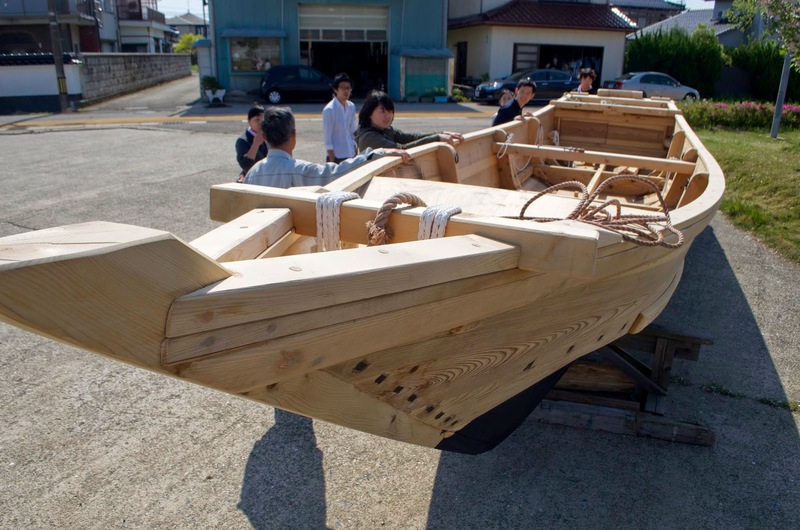 This was by far the biggest challenge for us last year building the boat in Takamatsu (see blog posts from July and August, 2013), so I can appreciate being relieved of that chore, but I don't really see what Bansho san means about this necessarily making it easier to build a wider boat. I may have misunderstood him or his opinion may just reflect the fact that in this region that's how wider boats were built. The view inside the boat, looking down at this box-like construction. 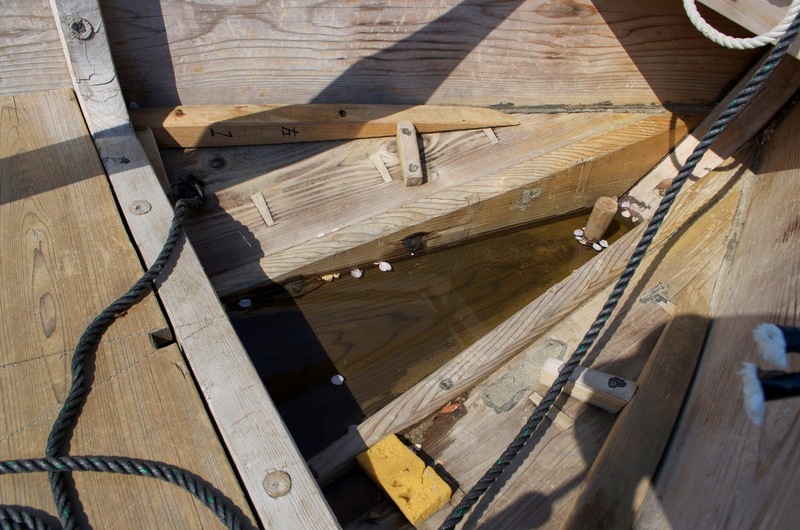 The keel is the dark triangle (water in the bilge) flanked by the two triangular pieces with the garboards fastened nearly flush to their top edges. Looking at Bansho san's new boat he pointed out to me the curve the cap rail takes. It lays on the flat making it even harder to bend. I'd been asking him about how he uses a flame to bend the planking. He also uses boiling water for some parts. Note the holes drilled in the cap rails inner edge. These go 3/4's of the way across the timber and Bansho san said that these holes allow him to bend the wood. 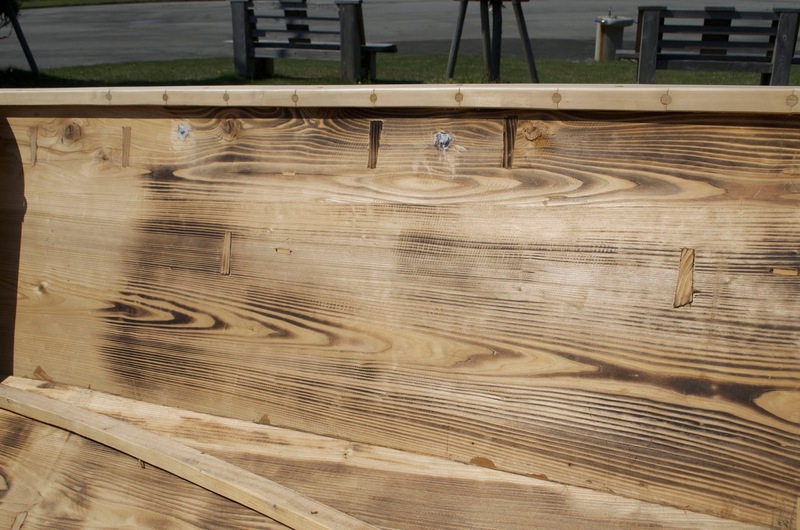 They allow the inner edge of the rail to compress, the holes go oval, and he said the wood peaks at the hole. He also said he makes a small vertical chisel cut at the hole. Once the timber is bent he planes off these peaks, redrills a round hole and plugs them. This photo will give you an idea of the spacing of the holes. The charring of the planking is visible below. The wood is actually charred quite dark; what you see is after it has been planed clean.